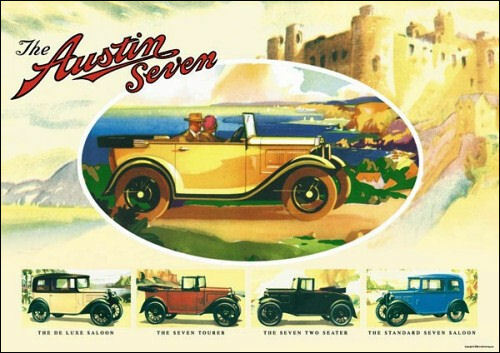 No sports models figure in the Austin list for 1932, the special "seven," which was introduced last season being discontinued. Their range will consist of the 20 h.p. 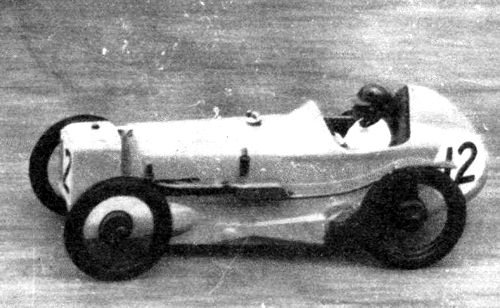 six-cylinder with various forms of bodywork, the "Sixteen-Six ", the four-cylinder 12 h.p. and the " TwelveSix " ; the 7 h.p., as with the other models, remains much as before, but subtantial reductions have been made in the prices. 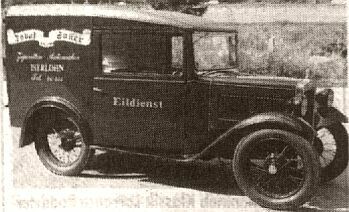 The prices of the " Twenty " varies from £498 to £575 according to the bodywork, the " Sixteen-Six " from £290 to £350, the four-cylinder "Twelve " from £268 to £288, and the" Twelve-Six " from £198 to £225. The 7 h.p. prices are : Saloon de luxe £128, saloon £118, touring car £118, two-seater £118, and chassis £94 10s. 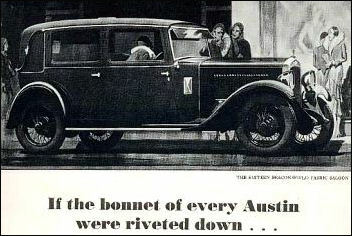 Manufacturers' address : The Austin Motor Co., Ltd., Longbridge Worhs, Birmingham. 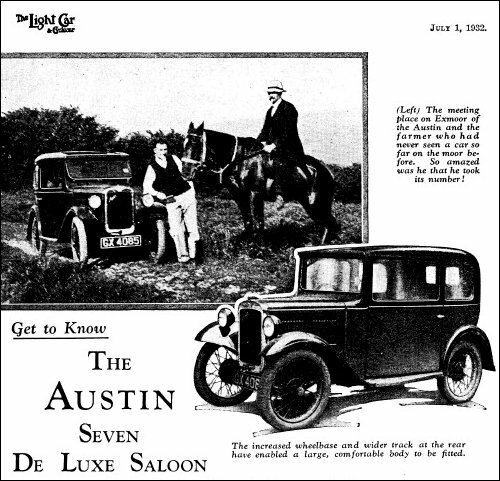 By April 1932, the full Austin range consisted of Seven, Ten-Four, Twelve-Six, 12, 16 and 20 HP models, with a wide variety of body styles. A four-speed gearbox was introduced in 1932. 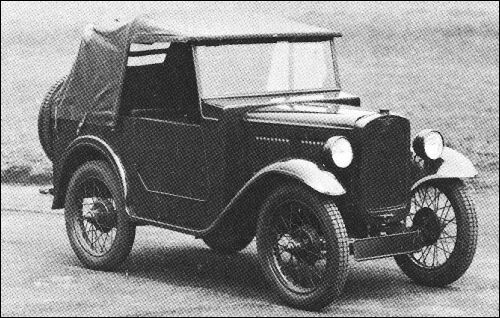 Austin is supplying Seven two-seaters to the British Army who use them for scouting and similar purposes. 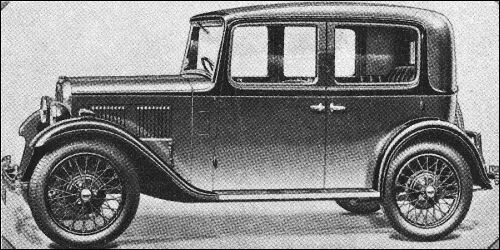 1929-32 models had a WD-design box back body; the front end sheet metal was like that of the contemporary civilian model. Initial equipment included 4.00-27 'knobbly' tyres. 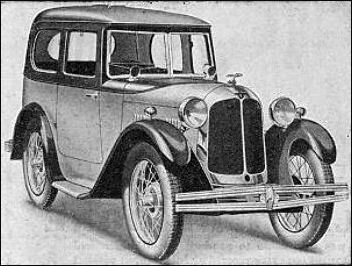 Shown is a 1931 /32 model. 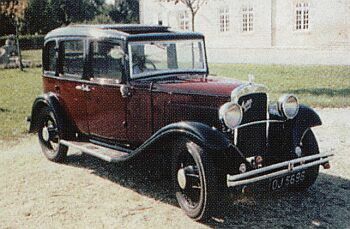 Austin Ten-Four is a new addition to the Company's 1932 range, introduced in April. It is powered by an 1125-cc 9.99 HP side-valve four-cylinder engine which gives a top speed of over 56 mph. The price of the new car initially available as a Saloon only at £168. A sunshine roof was an option soon after, but this was dropped in July when the Saloon de-luxe was announced with the sunshine as a standard. 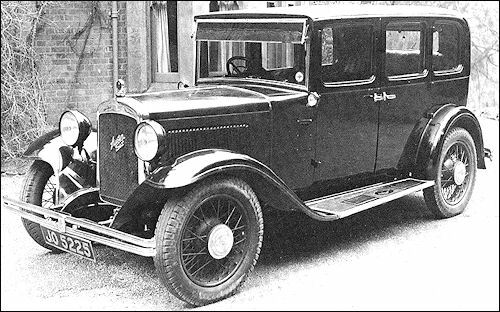 At the Motor Show in October 1932 other versions of the Ten were announced, a Standard Saloon at just £155, a four-door tourer and a two-seater tourer with dickey seat at £148. The Earl of March won the British Empire Trophy in up to 750 c.c. class.